Caution: It may prove difficult to get change when you go yacht shopping with this coin. The Australian Perth Mint has produced the biggest 999.9 fine gold bullion coin in the world. Featuring Queen Elizabeth II (Katie's silhouette would certainly have found more bidders) it weighs one metric ton. The coin is legal tender with a face value of one million Australian dollars. Its current gold value is €39.6 million (39.55€ million). 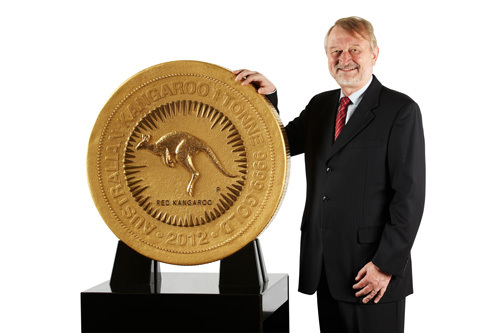 The colossal coin measures nearly 80 cms wide and more than 12 cms deep. This is the heavest superlative among high value legal tender bullion coins. In 2004, the Austrian Mint presented a 1,000 ounce (31.1 kilos) bullion coin. The Royal Canadian Canadian Mint came out with three 100 kilo coins in 2007. The price is really high! But then again with that size, that must have taken up a lot of gold. Are You Reft or Light?